In the Western states, either the legislature or petition-toting individuals can take issues directly to the voters by putting initiatives on the ballot. 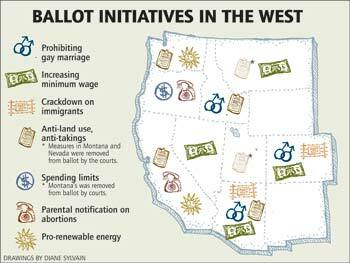 This year, the West is a hornet’s nest of initiatives: Voters face 82 ballot measures in 10 states. Come Nov. 7, for example, Coloradans will choose whether to legalize marijuana, and Californians have the opportunity to approve up to $41 billion in bond initiatives to fund highways, levee repairs and education. But the region’s initiatives also follow larger national or regional trends, and some are less about changing state laws than about firing up voters of one political bent or another to get them to the polls. Hot-button questions can help boost voter turnout in otherwise lackluster mid-term election years. Conservatives have leveraged anti-gay marriage initiatives — on the ballot in three Western states this year — to help Republican candidates. A similar measure is credited with helping President Bush carry Ohio in 2004. This year, it seems as if the left has caught on to the tactic. Republican lawmakers this summer shot down an effort in Congress to raise the federal minimum wage, which has stalled out at $5.15 per hour since 1997. In response, "living-wage" activists have put initiatives on the ballot in four Western states. If the initiatives pass, the bottom-of-the-barrel pay rates in Arizona, Colorado, Nevada and Montana could jump from $5.15 per hour to between $6.15 and $6.85 per hour, plus annual cost-of-living adjustments. Proponents also hope to energize voters who lean toward Democratic gubernatorial and congressional candidates. Arizona voters will decide whether to restrict development on 690,000 acres of state land in 59 parcels across the state. The coalition of environmental and educational groups that championed the measure say Proposition 106 will conserve natural resources and generate more revenue to fund public schools. But the state cattlemen’s association and the Home Builders Association of Central Arizona call 106 a "giveaway," and they’ve teamed up with the state Legislature to create another ballot measure, Proposition 105, which would conserve 43,000 acres with the potential of adding more later. Voters in four states will also decide whether to de-claw government land-use regulations with initiatives patterned after Oregon’s Measure 37 — all part of a national libertarian campaign (HCN, 7/24/06: Taking Liberties). Other initiatives include crackdowns on undocumented immigrants; governmental spending limits similar to Colorado’s recently incapacitated "Taxpayers Bill of Rights" (TABOR); proposals requiring parental notification for a minor child’s abortion; and pro-renewable energy measures. On the ballot: Will Californians vote to build an off-ramp from the oil highway?